From left to right: Tom Osborne of IFM Investors; Australian Ambassador to the United States Joe Hockey; and moderator Sia Kusha of AECOM. The pros and cons of asset recycling was a hot topic at ARTBA’s 29th Annual P3s in Transportation Conference, July 13-14, in our Nation’s Capital. In Australia, the most notable example internationally, asset recycling has incentivized state and local governments to sell or lease existing public properties to private investors. Under such a program, these governments receive additional federal dollars to fund additional transportation infrastructure improvements. The question is whether asset recycling is an effective strategy to fund billions in new infrastructure projects, or if the political and social costs are too high for governments to lease their valuable assets. The Trump Administration and some members of Congress are considering asset recycling as a component of an infrastructure funding proposal. 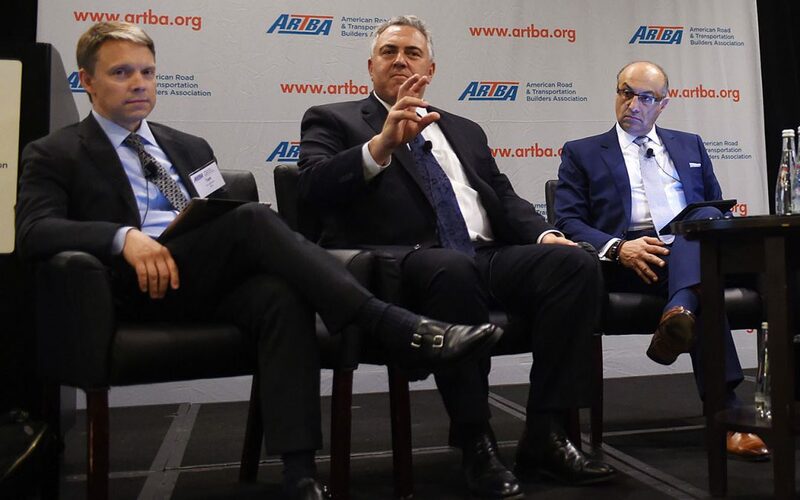 The Honorable Joe Hockey, Australian Ambassador to the United States, was the special guest panelist of this “Great Debate” segment of the conference. Ambassador Hockey previously served as treasurer of the commonwealth, where he played a major role in his government’s use of asset recycling as a short-term funding program to stimulate the economy. Other participants included Tom Osborne, executive director of IFM Investors; Kevin DeGood, director of infrastructure policy at the Center for American Progress; and Shar Habibi, research and policy director at In the Public Interest. Australia’s federal government was running out of money and needed to boast economic growth, Ambassador Hockey said. The nation’s states, such as New South Wales and Queensland, owned infrastructure assets from public housing to ports which did not generate tax revenue and in some cases had fallen into disrepair. So the federal government incentivized their sale or long-term leasing—putting them on the tax rolls as private entities—with a 15 percent sweetener conditional to the money being reinvested in new infrastructure. The offer was jumpstarted by making the government’s pool of money available on a first come, first serve basis for only a five-year period. The result: more construction cranes over Sydney than anyplace else in the world, the ambassador said. But there are concerns about the strategy. Habibi of In the Public Interest said that asset recycling can create higher barriers to access everything from roads to drinking water. DeGood of the Center for American Progress worried about local governments selling or leasing the assets too cheaply, or getting burned by unforeseeable outcomes of multi-decade deals. “Risk cuts both ways,” Osborne countered. “Everyone has to take educated guesses. Ambassador Hockey offered an example. A privatized tunnel in Sydney at first didn’t meet traffic projections, he said, but as other tunnels built nearby began to feed into it, vehicle numbers passed expectations. Osborne also suggested that asset recycling deals could give the public more confidence about the maintenance and operation of infrastructure through regulatory and contractual controls. Citizens have seen plenty of examples of state and local governments that deferred maintenance of public assets so the money could be put to other use, he said. Ambassador Hockey said it is important for local governments to make decisions about what assets to sell or lease, and what to build. That also provides political cover for the federal government incentivizing the project. However, “I’m not saying this is the only solution,” he said. For more information on ARTBA’s P3 Conference, visit www.artbap3.org.